Excellent! Love the highlites...this would have got my top vote for the music contest! Very well done, as matne said it's a pity you missed the music comp, I reckon this would have won... but I expect you will do pretty well in this one as well. Love the whole idea. Agree with the others have said. Agree with mayne... great work! Beautiful work and nice shot. nice! you do'nt see pixs of violin often...great job! I too have played the violin for a number of years and this picture is indeed wonderful. Great job. Wow, I love the choice of colors you brought out. Beautiful. luv this image...it is so gorgeous...amazing job...props to u! wow, amazing image! the detail i like the most is the ring! the contrast betweeen the golden ring and gray hand is fabulous, great idea! thank you for posting this outstanding image! i like this! great job. I really love the contrasts! This is amazing! oh this is beautiful! i used to play the violin and this picture symbolizes both the visual and musical arts. Lovely picture.. I love the touch of colors to emphasize the most important parts of this picture.. Great job! great colors, gold & red. i'm glad u made the ring gold too. "Too weird to live...too rare to die." absolutely amazing. 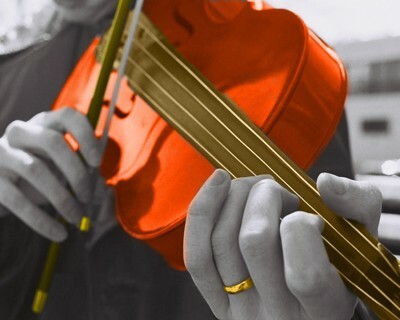 i love how shiny the violin and ring are...great work! I play violin--I live for violin!!! My profile picture shows it! The picture displays it so well that I could hear the music behind it. The bright color makes it seem like the performer is playing a tremelo--godly!! And the ring is like a sign of love. The power of music and love brought into one picture, a piece of art, is inspiring. I wish you were my mentor.